The Master of Science in Global Supply Chain Management (MSGSCM) builds upon Purdue’s core strength in operations, supply chain management, and business analytics to provide skills that will well position you for a career in managing global supply chains. It is also the most highly ranked new entrant in Gartner's graduate rankings at #12 for Top North American Graduate Supply Chain Programs. 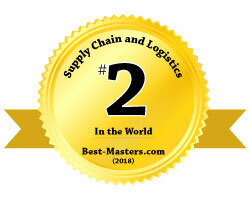 In 2018, College Choice ranked Krannert's MS in Global Supply Chain Management the #10 Best Masters in Logistics. The full time, MSGSCM program builds upon courses which develop your contextual knowledge and problem solving skills to provide a unique global work experience as a member of an international team. The program will also have students from Purdue’s global university partners, enabling a sharing of work experiences with teams from many different countries in both informal and formal class room environments. This program actualizes the global mindedness you’ll discuss in class, preparing you for leadership roles in global supply chain management. The MS Global Supply Chain Management program is a STEM certified program (for details regarding the associated STEM OPT extension, please visit the USCIS website). Students holding an MITx MicroMasters credential can waive 10 of the required hours towards the Purdue MS Global Supply Chain Management degree. Contact us to design a plan of study that works for you! For more information on the MS Global Supply Chain Management program, contact Erin Britton at erinbritton@purdue.edu.